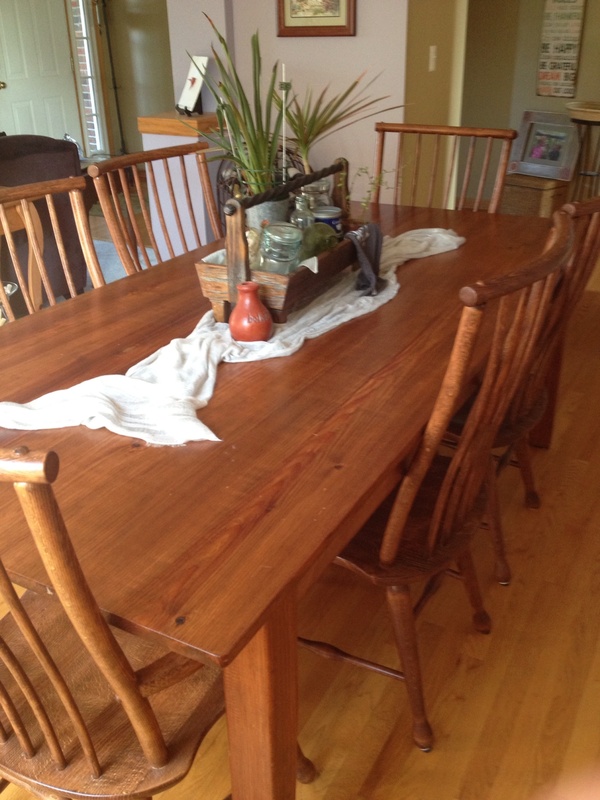 The first piece of furniture that my husband and I bought together was our kitchen table. That was almost 17 years ago. The table has made it through three moves and is just as sturdy as the day we bought it. Did I mention that it was handmade and cost $400 for the table and four chairs? Who made this long-lasting furniture? Conley's Classics & Antiques. Though their workshop is located in Kewanee, you don't have to drive that far to meet them. You can find them the same place we did, the Kane County Flea Market. Held the first Sunday (and preceding Saturday) of every month, Conley's has been a staple at the market for decades. A few years ago when we needed a dining room table, we didn't hesitate to visit them again. I love their craftsmanship, and I especially love that they used old barn wood to create it. In addition to the table and six chairs, we also had a bench made so we can easily seat nine without any leaves. Visiting their Flea Market "showroom" gives you the opportunity to select chair styles and table designs. Having a hard time finding your ideal dining room or kitchen table? Let Conley's create an original for you. My friend needed a large round table for her family of 7, but wasn't having much luck. Conley's created exactly what she wanted for a fraction of the price. Not only is her table gorgeous, the chairs are incredibly comfortable. It's definitely durable enough to withstand years of family dinners, homework, and crafty projects. The next Kane County Flea Market is October 5th & 6th. You'll find Conley's in the Swine Building- space #24.